I know, I know. The stats are unimportant. I would still blog even if no-one read what I wrote, simply because it means that I can voice my opinions, and not impose them on anyone else. After all, I don't force people to read my blog. They can always go elsewhere if they don't like my opinions. But it is encouraging to think that people are actually interested enough to click on a link to see what I'm up to. My sporadic posting has lost me rather a lot of readers, but around 250 people a day have stuck with me despite it all, and when I actually post something, the numbers go up. I'm a very small-time blogger. Nowhere near, for example, either His Hermeneuticalness, the lovely Fr. Blake or the incomparable Fr. Z. But I don't have any official role in the Church - and my opinions are just my own, without any authority behind them, so it's quite touching to find out that people want to read what I write. Admittedly I might be getting more readers for the kitty updates than for my views on religious matters. 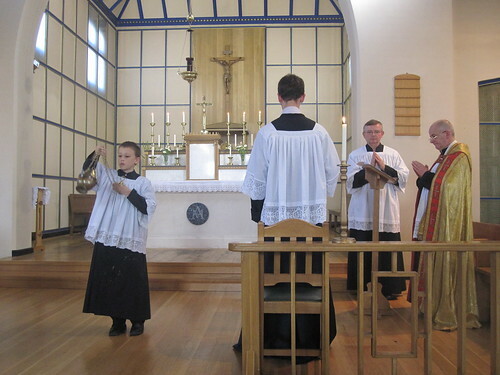 One of the customs which I have only encountered since attending the Extraordinary Form of Mass is that of having a full Requiem Mass with Absolutions at the Catafalque. 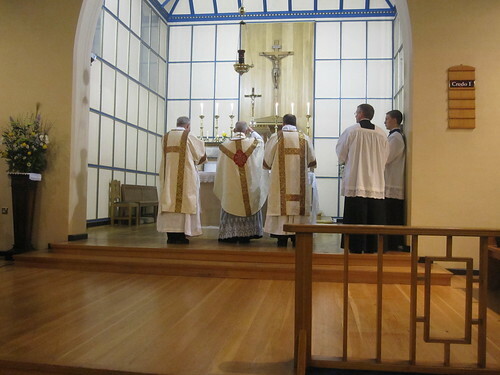 I have been at Novus Ordo Masses which have been offered for the intentions of the deceased person, of course, but in these it seems that the intention is "tacked on" to the Mass being offered anyway. The readings are those of the day, saints and seasons are commemorated as normal - the only thing that tells you that we're praying for a dead person's soul is the Mass intention printed in the bulletin or announced by the priest. 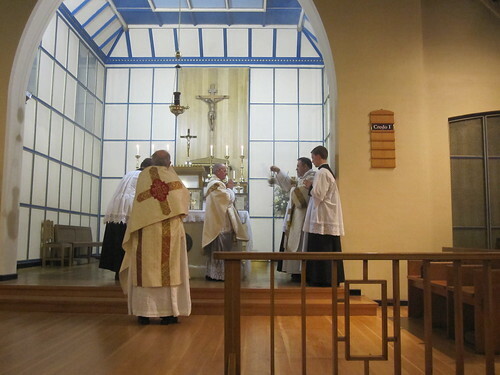 Obviously the actual funeral Mass is for the deceased person's soul... though sometimes there is far too much emphasis on celebrating the person's life, and not enough recognition that the person concerned is now undergoing the purification of Purgatory and is in desperate need of our prayers. I'm not being morbid in this reflection - just practical. St. Bernadette was concerned that people would be so busy thinking her a saint that they would forget to offer prayers for her soul... and she would be "cooking" in Purgatory. If such a great saint expected Purgatory, the rest of us really should prepare to go there too! There is something very moving about having a Requiem Mass in the Extraordinary Form, especially on a person's anniversary. Today was the anniversary of the death of Fr. 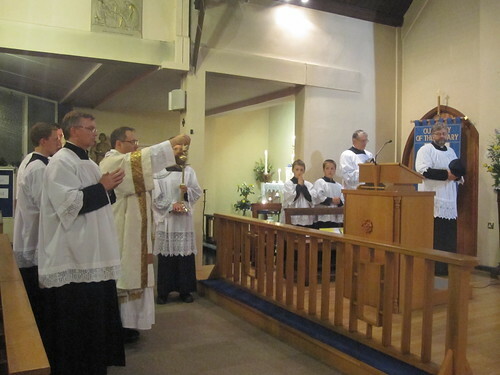 Tony Pyle, the previous Parish Priest at Our Lady of the Rosary, Blackfen, and so we had a Missa Cantata. It was beautiful. Yes, I know Mass is always beautiful... but sometimes it hits you more than at other times. If you're interested, a few more photos from the Requiem can be found on my Flickr page. I heard a few reports (from the more liberal wing of the Church) that the Pope was so old, he couldn't possibly last long, he was just a "caretaker" until they could get a "better" candidate. 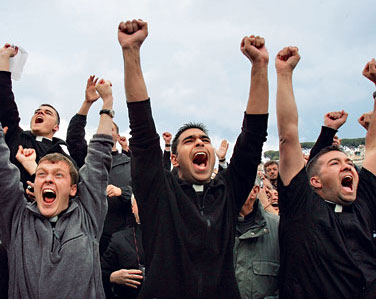 Seven years on, I just want to say these words to the naysayers - "Summorum Pontificum, Universae Ecclesiae, corrected ICEL translation, Ordinariate and SSPX!" Well, actually I also want to add "Hah! So there!" But I do sincerely hope we get to sing a few verses of "God bless our Pope" after Benediction this evening. 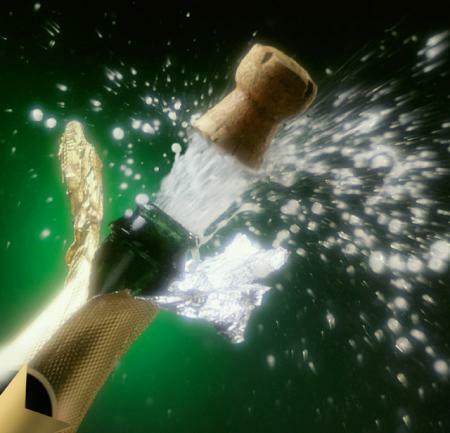 I wasn't blogging when the Pope was elected, but I have posted my memories of the event - last year, the year before (the fifth anniversary) and the third anniversary. It's worth going back and having a look to read the comments - which is why I'm not simply cut-and-pasting! If you didn't get a chance to share your memories before, do feel free to comment this time around! God bless our Holy Father, Pope Benedict XVI... and ad multos annos! Oh dear. The challenge has been issued. The inimitable Fr. Z has suggested that His Hermeneuticalness is notoriously bad at incensation, because of the need for fire drills among the servers. His Hermeneuticalness has countered by asking Fr. Z to choose his weapons... himself opting for a Heckler & Koch MP5. However, I think that Fr. Z has failed to consider the need to train servers in fire-fighting technique. 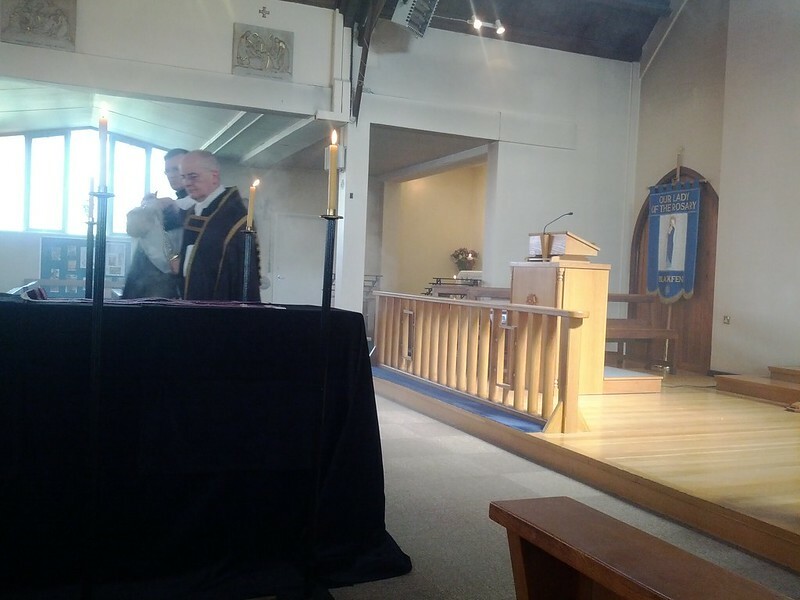 Some of those servers wield a mean thurible. Ever wondered why we don't have a carpet on the sanctuary at Blackfen...? I can confirm that Fr. Tim has, on occasion, had to step back rather sharply to avoid concussion. ...and, as my photographic evidence confirms, Fr. 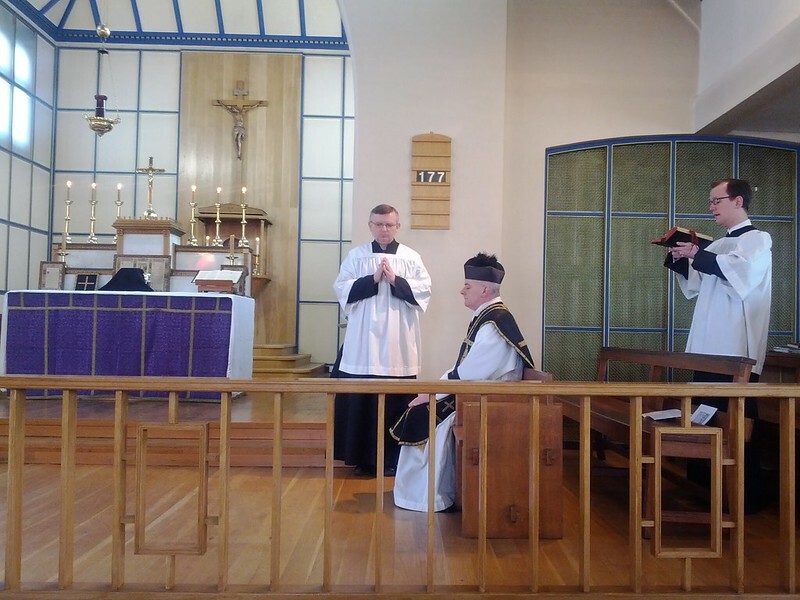 Z resisted the impulse to "take out" His Hermeneuticalness despite the obvious opportunity offered to the deacon at High Mass. Sadly, I cannot recall whether there was much in the way of clinking. Next time I shall have to video proceedings!